Speaking in Davos in 2015, Microsoft CEO Satya Nadella said, “…technology empowers humans to do great things. You have to be optimistic about what technology can do in the hands of humans.” It is easy to see the impact technology has had on us and our society in such a short time. Apart from the conveniences we enjoy, technology is revolutionizing our economy and the way we do business. Yet, law firms have been slow to adopt new technology. I have previously written about the brave new world legal technology is opening up for solo and small law firms. Law technology has changed every part of the legal field. The paperless, virtual office is becoming the new normal. Lawyers, paralegals, and legal secretaries are starting to realize how much of their work is simplified and automated with technology. Solo and small firms need to adopt new legal technology to keep up with larger firms. At one time, the impulse is to say “I don’t really need it” to legal technology might have been correct. Those days are behind us. Once you realize the benefits technology can have on your practice you will wonder why you waited so long. Here are some actionable steps you can take to improve your firm’s efficiency. A lawyer’s job is to practice the law. Yet, many lawyers are spending too many billable hours on administrative/clerical duties. Outsourcing these tasks to paralegals creates extra work for them and keeps them from focusing on the client and their legal duties. A secretary could handle these responsibilities. However, not all solo and small firms can afford to hire an extra staff member just for clerical work. So, the problem becomes how to complete these menial tasks faster and get back to practicing the law. The answer is to start using case management software, like PracticePanther, to easily automate many of the menial tasks that take away time from billable work. First, automate the repetitive tasks you do every day. In the software, use document automation to create prefilled document information for frequently used documents. In a Microsoft Word document, you would typically need to manually fill in all the information for an engagement letter. However, the software will show you the different fields that you can add into a template, like a contact’s name and case number, and you can copy these fields into your Word document. Next, save the document as a .docx file and go back into the software. Click the New Document Template button, name your document, and select the file you just created from your computer and save it to the software. So, now whenever you want to apply this template to any of your matters, simply go to that matter and click the “New” button. Click “Apply Template” at the bottom, and apply the template. A document will be automatically generated for you with all the client information filled in for you. You never have to waste time manually writing these documents again. Time tracking is another task that can be automated so every billable hour is recorded and charged to the client. You can set an hourly rate for yourself as well as all other users, create convenient time entries, track time from any device, generate invoices, and compare time entries across users and matters. Lawyers should use the timer in the software to easily track every second spent on a billable task. Stop the timer once the task is done, then convert those hours into an invoice so you can accurately bill your client for the work you have done. You should not guess how much to charge a client. First, set your default hourly rate in your settings menu. Find the hourly rate box and simply enter your going rate. Each user can set their own default rate. Alternatively, the owner of the account can go to the ‘More’ tab on the left-hand side, select ‘Users’, and select the user for whom you want to set the default rate. Next, create a time entry by clicking the ‘+New’ button on top and select ‘Time Entry’. Select the Contact and Matter for which you want to create a Time Entry. You can then use our built-in timer to track time with your client, or manually input the amount of time spent with your client. You can even pause the timer and resume. Once the task is complete, stop the timer and generate an invoice for that billable time. Go to ‘Matters’ and select the ‘Invoice’ option on the Matter for which you want to generate an invoice. After you’ve selected ‘Invoice’, simply click the ‘Generate Invoice’ button. This way, you will never lose a billable second or have to spend a lot of time creating spreadsheets and calculating amounts. Technology has made legal work vastly more cooperative. Attorneys can now reach out to other attorneys and clients from anywhere and in any part of the world through a client portal. The client portal offered by PracticePanther’s software improves transparency and trust, leading to happier and more profitable clients. Additionally, you can continue to run your firm efficiently by assigning tasks to your clients, invite them to meetings or court dates, send them invoices, share files, and send secure messages. This way you eliminate the hassle of spending hours playing email tag with clients and hoping your staff is on track with their work. To start with, create events or tasks for employees and clients from PracticePanther. Under the ‘+New’ tab, select ‘Event’ or ‘Task’. From there, fill out the form with all information relevant to the Event or Task, and click ‘Save’. You can invite a Contact or another User to an Event you have created. On the Event or Task page, type any User or Contact you wish to be included as an attendee under the ‘Attendees’ tab. Assign multiple users and contacts to the event and send them an email reminder. Moreover, you can remind your staff and clients about important deadlines with SMS & email reminders. After you select ‘Event’ or ‘Task’ under the ‘+New’ tab and have filled out all the information for the given event/task, click the ‘+Add a reminder’ button and select the method (Email, Popup, or Text Message) and time of the reminder. Then just click save and the reminder will be sent when you requested. The client portal also saves time by allowing clients to electronically sign documents. You can eliminate the time it takes to coordinate your schedule with the client’s by uploading their documents to the client portal and sending them an encrypted email. The client can sign the document and send it back to you without ever having to take time off work to visit your office. You save time and can dedicate your efforts to advancing the client’s case. These are just a few of the automation features you can adopt to make your firm more efficient. Whether you are a Baby Boomer, Gen Xer or Millennial attorney technology makes your job easier. Law practices can only benefit from the changes the tech revolution offers. 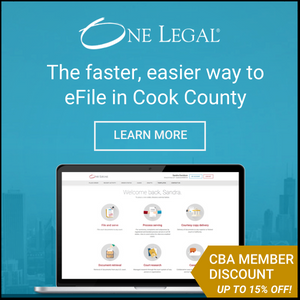 PracticePanther is a member discount of the Chicago Bar. Sign up with PracticePanther and use the code 10off4cba to get 10% off the monthly plan.